Hundreds of under-served area children are ready to head back to the classroom now. They got to stock up on school supplies Sunday thanks to the National Council of Jewish Women, St. Louis section. “I got coding and some other books,” said soon-to-be 4th grader Jordan Smith after he weaved through piles of school supplies, tables of books, and racks of clothing. 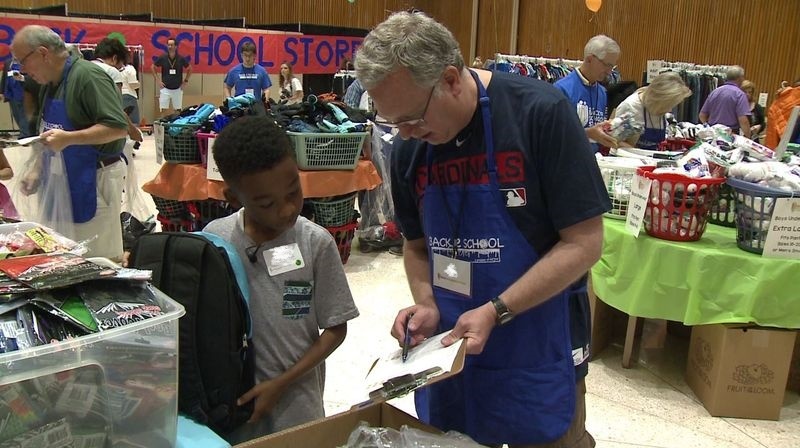 He is one of 1,400 children shopping at this year’s Back to School Store. Six hundred volunteers help collect the new school supplies and personal shoppers guide students through the free-store. Organizers said each child takes home close to $200 in school supplies. “A child who has their own coat and own pair of shoes, brand new, will be more likely to stay in school and eager to go to school,” said Packman. Teachers including Jordan’s mom, Janel Smith, said that confidence makes a difference all year in the classroom. “I think it’s about making their own decisions and it kind of empowers them to know they can do it on their own,” said Janel Smith. Jordan Smith, with his backpack full, agreed. “You can do whatever you put your mind to,” said Jordan Smith. This is the 18th year for the event.